← Previous Previous post: Where’s the community’s focal point? It’s the railway station. Next → Next post: Election day! I too watched the ABS Fact Check segment and didn’t think of the padding. I wouldn’t know where to get historical timetable information from so thanks for providing the chart. PS Will you be out in Bentleigh campaigning tomorrow? And, of course, the proportion of *trains* that run late says nothing whatever about the proportion of *passengers* who suffer from late running. It’s quite likely that late running is worst in the peak periods when the trains are fullest. So the proportion of passengers who suffer from late running may be much higher. The fact that an almost-empty train at midnight is on time is nice, but that doesn’t benefit many people. To be fully useful, the statistics should weight each train by its load to estimate the propotion of passengers that suffer from late running trains. If this were impractical, some approximation weighting trains by time of day (as a proxy for likely load) would be easy to do and more useful than the present numbers. Weighting by passenger loading might be good from a “best benefit for the most” perspective (usually a good way to assess things) for assessing the total impacts of poor service delivery, but poor service at times of the day where there should be more delays can also cause problems, such as trying to connect with late night buses (or other trains, etc). Really a fairly-reliable service should be expected at all times of the day (where needed, additional time should be added to timetables, but…. ), but as a passenger I expect it much more at off-peak times (and especially at night). Part of making the service attractive is a sense of general reliability, that it can be depended on. If you can’t get it working when massive passenger demands aren’t slowing down the system, that’s pretty telling. 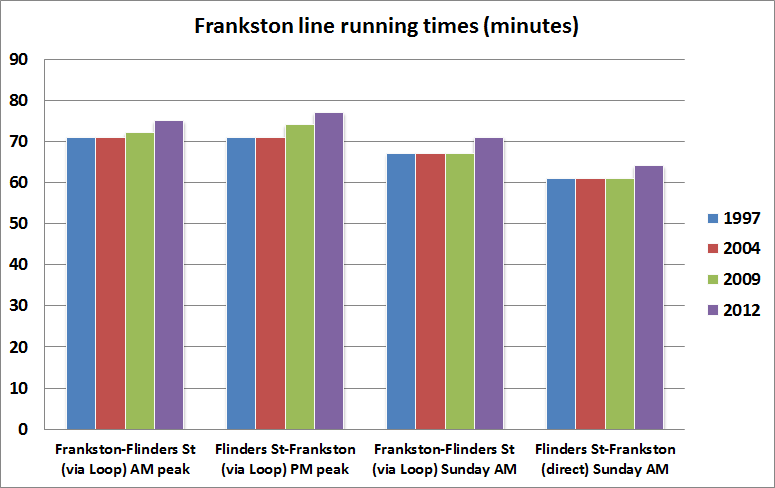 On padding, Frankston trains regularly wait at places like Cheltenham (with the boom gates sitting down, too) for minutes at a time, or crawl along sections of track, because 1 to 4 minutes have been padded to many runs across all days of the week, including weekends. It is ridiculous. A journey that used to take 58 minutes (Frankston to FSS at late night) now takes 62 minutes, and often the trains end up early for most stations, which is terrible (frankly timetable design for passenger use should list a time slightly earlier than the bus/train comes so people aren’t left behind thinking they can get it at the listed time, and “timing points” like major stations can be correct to the real running time). It is an easy and very annoying “solution” to the lateness problem. It isn’t really the state government (of a particular persuasion) that’s at fault, it is the whole system between the private operator, bureaucracy and how they work together and how the contracts are structured, and a general lack of care about meeting the needs of passengers. Basically: no one cares, properly cares, about doing things right and correctly.